A joint cartilage– and tissue-support formulation specifically engineered to help you maintain lubrication and joint mobility. Arthritis and osteoporosis are major public health concerns that often remain resistant to conventional medical treatment. Osteoporosis is a bone disease that is characterized by a diminution in bone-tissue mass. This bone thinning results in weakness of the skeleton and a predisposition to bone fractures. In individuals with osteoporosis, bone resorption appears to be increased, whereas bone formation may be normal or defective. Glucosamine sulfate is a stable, clinically studied source of glucosamine, which is the fundamental building block required for the synthesis of connective tissue subunits (glycosaminoglycans). Glucosamine is an essential building block of proteoglycans, hyaluronic acid (a component of joint lubrication), and glycolipids, and it is essential for the proper formation of tendons, ligaments, synovial fluid, bones, skin, nails, and blood vessels. Joint-builder glucosamine is naturally water-soluble and low in molecular weight, thereby offering rapid and high absorption (over 90%). Methylsulfonylmethane (MSM) is a sulphur donor, which is essential to the formation of the chondroitin sulfates. Sulphur is essential for numerous electrochemical, catalytic, and structural functions in human metabolism. Sulphur is a key component of MSM, which helps connective tissues and joints, and is needed for enzyme activity, hormone balance, and function of the immune system. As a central component of collagen and connective tissue, sulphur assists the body in preventing inflammation and facilitating repair of connective tissues. Shark cartilage is an excellent source of calcium, phosphorus, and proteins with high concentrations of mucopolysaccharides, chondroitin sulfate, and vitamins A and C. Clinical studies have shown significant reduction in joint pain and stiffness, and it is currently under study for its effect on patients suffering from cancer. It is effective in the treatment of gout, tennis elbow, sports injuries, and back pain, as well as for mending broken bones faster. It is known to be very effective for the condition of dry socket. Shark cartilage has anti-inflammatory properties, which help relieve most types of pain. 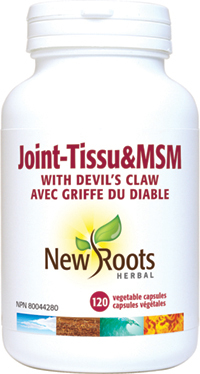 Devil’s claw, a tuber from Africa, is primarily known for use in arthritis. It reduces inflammation and is analgesic in joints and connective tissue. Clinical studies have shown that it is effective in alleviating arthritic symptoms; the harpagosides in Devil’s claw are mostly responsible for this. It can be used for long-term or new joint pain. It can also alleviate pain from overuse as well. Recent research has implicated nutritional factors as important in the maintenance of bone and joint health. Despite the increasing recognition that osteoarthritis and osteoporosis may have nutritional abnormalities at the root of their causation, dietary programs have often played a secondary role in the management of these diseases. Recently, nutritional interventions and supplementation have been increasingly proposed as effective options for these disorders, which are often unresponsive to current, conventional medical interventions. Adults: Take 1 capsule three times daily with food or as directed by your health-care practitioner. Avoid taking at bedtime. Pure ascorbic acid, USP grade, in powder form.